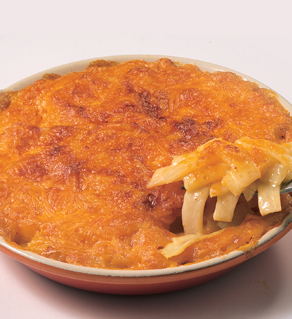 Captain Ken’s AU GRATIN POTATOES are make with fresh cut potatoes, then mixed in a rich and creamy aged cheddar cheese sauce. More shredded cheddar and parmesan cheese is layered on top. This recipe originated at a local eating establishment situated on the shores of Gull Lake, in northern Minnesota. 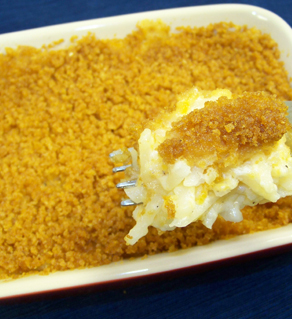 These cheesy potatoes is another fully prepared product from the Captain. All you need to do is heat, serve, and enjoy. Note: Country-Style cut potato shown. Captain Ken’s CHEESY HASHBROWN POTATOES are made with only fresh shredded potatoes in a creamy chicken soup with lots of shredded sharp cheddar cheese, fresh cut onions, sour cream, real butter, and a special blend of seasonings, all topped with crushed corn flake crumbs. Serve this favorite with eggs and bacon for breakfast or with steak at dinner.